Home R-22 Does your air conditioner use R-22 refrigerant? Here’s why you should care. Does your air conditioner use R-22 refrigerant? Here’s why you should care. Most air conditioners use one of two types of refrigerant: R-22 or R-410A. I’ve never paid any attention to this detail while inspecting houses because it didn’t make much difference, but that’s all starting to change. The price of this refrigerant is starting to skyrocket, and unlike gasoline prices, I don’t expect the price to fluctuate. It’s just going to keep going up. Why is the price of R-22 increasing? In short, R-22 is becoming scarce because the US has agreed to phase out the production, import, and use of this refrigerant because of it’s damaging effect on the ozone layer. This has driven up the price and will continue to do so. By the year 2020, this refrigerant will no longer be imported or produced. Head over to the EPA website for more details on the refrigerant phase-out. 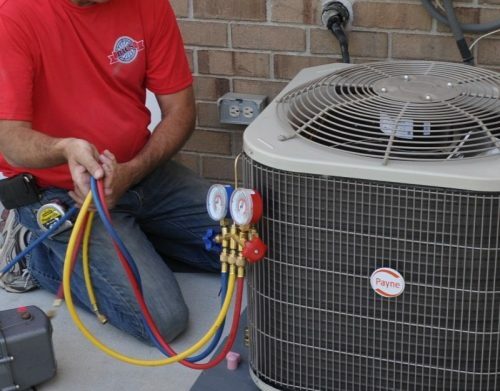 If your air conditioner uses R-22 refrigerant and the refrigerant leaks, it will be expensive to recharge the system. In the very near future, it will likely become either cost-prohibitive or downright impossible. Manufacturers are also rationing the amount of R-22 refrigerant being sold to HVAC contractors. To know which type of refrigerant your air conditioner uses, take a look at the label on the compressor unit outside. It’ll clearly tell you which type of refrigerant the unit uses. The newer type is R-410A, and the older type that I’ve been talking about is R-22, also identified as HCFC-22. Up until 2015, air conditioners could still be manufactured to use R-22 refrigerant, and many were. If you have an air conditioner that uses R-22, hire an HVAC contractor to do a tune-up on your system and make sure your system doesn’t have any small leaks. If there are leaks, have them fixed. This will help to reduce future costs and will help to prolong the life of your system. For the record, adding R-410A to a system designed for R-22 is bad news. More on that topic here: http://www.supplyht.com/articles/97376-can-you-mix-r22-with-r410a. He asked a 410 vendor why mixing was a bad idea and was given a group of what he considered suspicious answers to say it was bad. He then goes on to talk about teaching partial pressures with incorrect information (when you mix two liquids, the pressures are not their own but are changed by the interactions of the molecules). I was just talking to a licensed A/C tech last weekend and he is not happy with 410. It runs as a much higher pressure that stresses the equipment and makes small leaks around seals act like a larger one would with 22. He said he is doing much more frequent recharges with 410. Thank you for posting this important information. Per the Clean Energy Bill signed by the President in 2010, manufacturers were ordered to stop production of air conditioners that required the R22 refrigerant and allowed home owners up to 10 years to upgrade to an energy efficient system. R-22 damages the ozone. As of January 2020, the remainder of the law will be in affect and proper disposal of any remaining R22 refrigerant will be required by law. There are rebates available for home owners who need to install a new air conditioning system, through some home warranties, local electric and gas companies and when filing income tax. See EPA. GOV website to view the Clean Energy law. When I purchased my home in 2014, the home inspectors failed to notify me of this law and the fact that the home air conditioner required the R=22 refrigerant. To be fair to your home inspector, I don’t believe this is something most home inspectors even look at. Up until a couple of weeks ago, it’s not something that I had ever looked for.